Was never going to win regardless. If you can't jump then you don't deserve to win, headgear just screams dog as well. Glad I took 20-25s in the week, 4/1 seems crazy with horses like Death Duty coming tomorrow. Neptune usually is a race where you just see what turns up and bet on the day for me at least. Dynaste backers, oh deary me. Small bet on Blood Crazed Tiger at 14/1, can't back the front two at their prices. Maybe Finians Oscar will beat them, not impressed by either. Nothing to say Augusta Kate was going to get by either, looked that way but she did also look very green and awkward the entire way round. I Just Know gets another shot at 3/1. Other bet was My Renaissance at 2/1. May have been posted, Dynaste has finally been retired. Unsurprisingly, Conygree is going to miss the Gold Cup. Think it is going to be a poor turnout this year. Mind you, I have backed Alary at 50/1 so not bothered at all! 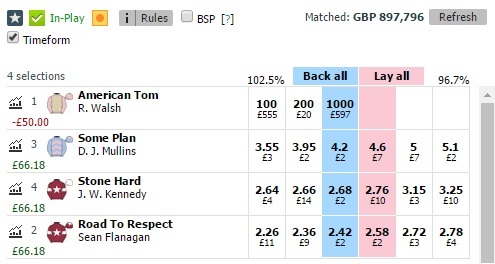 Also backed it for the National at stupid prices. Whenever I back a horse with Adam Kirby riding he always kicks too soon and gets done on the line. Teach me for betting on Class 6 racing.